Mary Scattergood was born in Somerset, England and her family emigrated to Canada when she was 2 and took up residence in Toronto. Kleinburg was her home for many years, but she now lives on her dream farm, in Caledon, Ontario, with her family. Mary spent many happy hours at The McMichael Art Gallery teaching her children an appreciation of art. On Sundays they listened to stories told by A.Y. Jackson sitting on the big oval braided rug. At school, Mary worked under mentor, Nancy Main, well known as the founder of the Etobicoke School for the Arts. It was in grade three that Mary sold her first works of art; 5 x 7 inch squares of specialty paper with multi-coloured butterflies in pen and ink. It was in the mid ‘80s that she began painting in Acrylics after years of working in oil and watercolour. Until recently she ran a very successful teaching studio in Kleinburg and has passed her love of painting on to many hundreds of students. 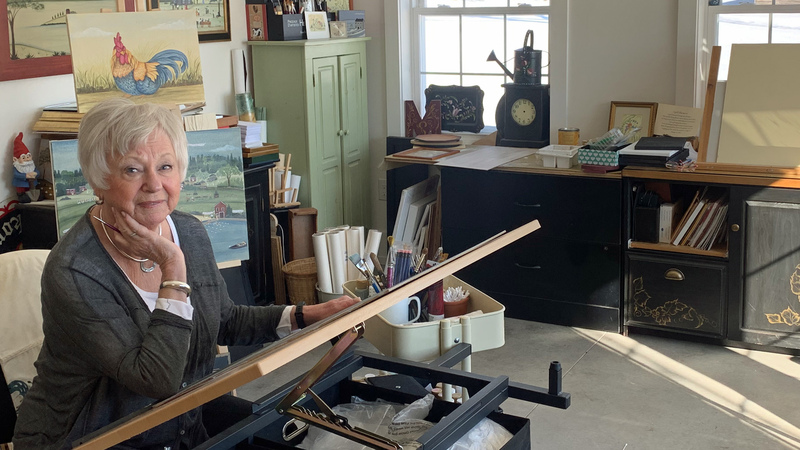 Mary has taught classes for Arts Society King, The Dufferin County Museum, The Rufus Porter Museum in Bridgton, Maine and she has just added The Southampton School for the Arts to the roster. To see where Mary is next please check Events. Painting covers a diverse range of artistic styles but Mary’s passion falls into two categories. The first being Traditional Strokework, or Country Painting, based on two hundred year old patterns. This is the artform which Mary teaches, usually on tin. The second is Primitive or Naïve art. In Mary’s first year of high school, Grandma Moses died at the age of 101 years. Nancy Main brought in some examples of Moses work and Mary fell in love with a wonderful world. Grandma called it “Memory Painting” and so does Mary. She hopes her paintings instill feelings of a simpler, kinder world and give her audience the same sense of peace that she experiences in the creation of them. Although primitive artists such as Rufus Porter and Grandma Moses had no formal fine arts training their message came through loud and clear and the technique is still being perfected through artists like Mary Scattergood today.